Below: rebuilding walkways for rampless barrier-free accessibility. Right: the first sections of more than 5,000 board feet of studding go up. A brute of a job in 15 and 16 foot high sections, up to 16 feet wide. Below: A celebratory 1-year anniversary cake. Yeah, we look a little mad at this point, but the slog has just begun. FALL 2010: With building permit in place, our volunteers tackle the job of gutting and rebuilding the car wash! Left: from the lobby to the rear of the building. Below: from the rear to the front of the building. 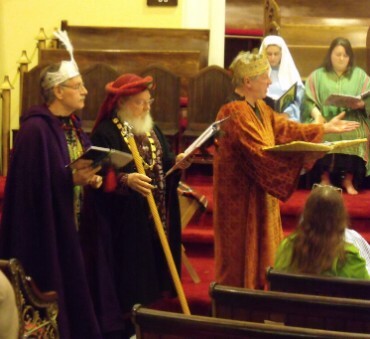 Heavily into the throes of construction, we still found time to mount a very special event for Christmas: an original adaptation of the Nativity plays from the 14th century Wakefield Mystery Cycle. Performed in the beautiful St. Paul's United Church in Perth, it was a lovely and very entertaining show, if sparsely attended. Riotous fun and sacred moments combined. 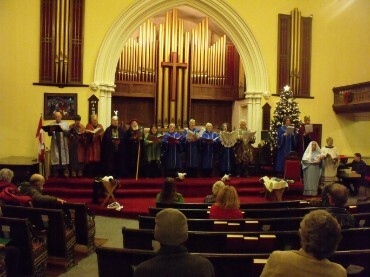 Left above: the cast of The Christmas Mysteries sing Guadete! to organ accompaniment in the finale. Left below: The Three Kings. 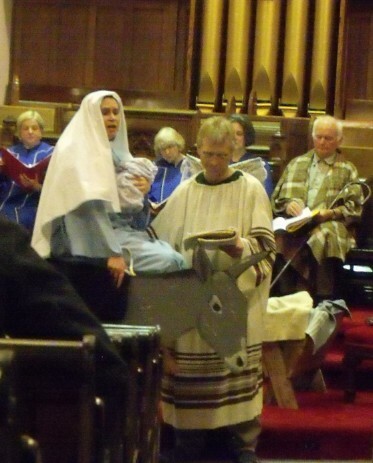 Below: Mary, Joseph and the Babe escape to Egypt. 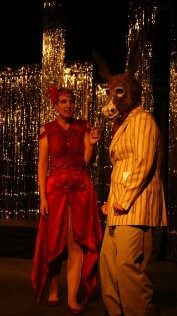 Oh, and Hotie, the donkey. Donkey Hotie? Get it? Oh, well. Below: the subfloor for the auditorium rake, with some of the sheathing on it, the tech area in the bg, stud walls around the perimeter. 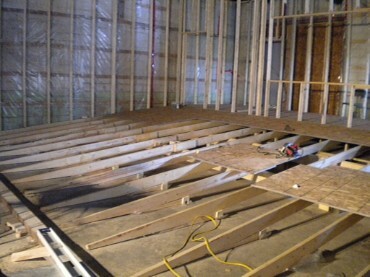 Right: The framing for the stage: tripled 2X8 beams, 2X8 joists on hangers and screwed!, all sitting on 6X6 posts. You can actually drive a car onto the stage! Below: Days after we put the stage floor down, we took time out of construction to build the set for a new opera, Open House, which we had contracted to produce for Popinjay Productions. By this time, we were down to 1 electrical circuit! Work on the building continued through snow and sleet -- literally. Left: Gary King working on the frame for the new rear exit door. Note steel lintels above the door, 4X4 posts and additional 4X4 lintel -- it's built! Below: a crew lift one of the last stud frame units into place. Note the unit with the fire door already in place, filling one of the bay door openings. Below: the set for Open House, on the stage at the Perth Theatre Project's Studio Theatre. As the weather began to warm, progress quickened. Insulation went in, dry-wall began going up, tradesmen began to appear and a faint glimmer of light was seen at the end of the tunnel. Left: cutting drywall, using the edge of the stage as a convenient work table. Note the R40 fibreglass insulation on the rear wall. Below left: dry-wall going up on the box-office and lobby walls. Below: the stage with Safe'N'Sound insulation installed. The entire auditorium is surrounded by the stuff, which, combined with other aspects, cuts noise transmission by an amazing 81 deciBels. That's a Grateful Dead concert cut down to a quiet afternoon reading in the parlour. Left: a slightly fuzzy shot of assembling seats. 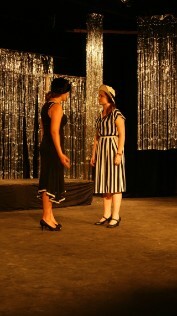 They came out of Perth's 1915 Balderson Theatre, a sumptuous vaudeville/cinema house that ran until 1958. From there, the seats went to P&DCI high school until 1988, when we grabbed as many as we could. Refurbished, we have 102 installed and another 50 or so available. Left and below: cleaned up and ready for June 18th's Doors Open Ontario showing. While a long way from done, this was the first opportunity for people to come through the building and see what was happening. We opened a few eyes! Left and below: Huge work continued with mudding and finishing drywall, running electrical wiring, preparing reclaimed and re-purposed materials, painting, adding HVAC equipment, and, of course, plumbing. 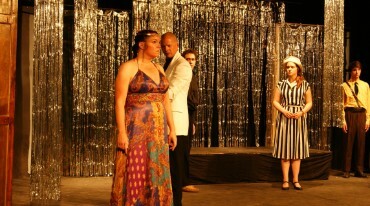 The Full Circle Theatre building, August 5, 2011 -- Opening Day! 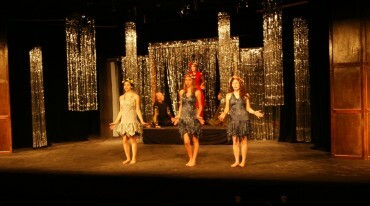 CLICK HERE FOR VIDEO EXCERPTS FROM THE SHOW! If you can think of a better production to open a dream theatre, then you're smarter than we are. This Dream was a dream. What a cast, what a production! Hilarious, frightening, mysterious, furious, poetic, musical, romantic, exciting and much more, with some brilliant performances from a very strong cast. AND, we opened our new theatre, too! And now, we begin a whole new chapter! 2011-2012 is going to be exciting indeed!